You guys! I’m like, totally kind-of not-really-but-a-little-bit famous! I’ve been lucky enough to hook up with the fabulous people over at Terrain (one of my favorite home/gardening/loveliness stores), and become a contributor to their beautiful blog, the Bulletin! My mission, which I’ve clearly already chosen to accept, is to act as their West Coast farmer’s market envoy, which means I now have every excuse possible to spend the majority of my time at the Ferry Building surrounded by figs. And tomatoes and fresh bread and apples and cheese and squash. Obviously. 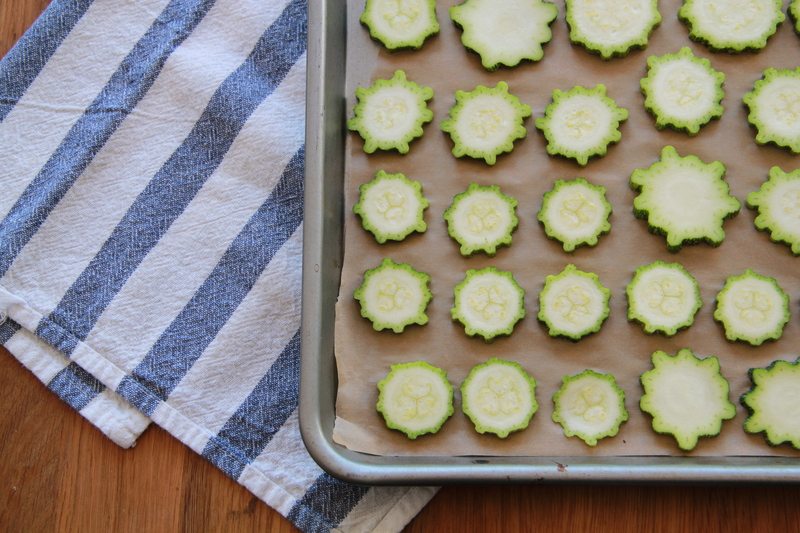 To celebrate, zucchini chips! Rounds of pale green zucchini, baked to crispy brown in a hot oven and slathered with cool, creamy pesto. I ate some as such, and then put the rest over a bowl of hot pasta with Parmesan cheese (a move that took everyone by delicious, delicious surprise). I highly recommend it (and I’m an envoy now so, I mean, I would probably know. Just saying). 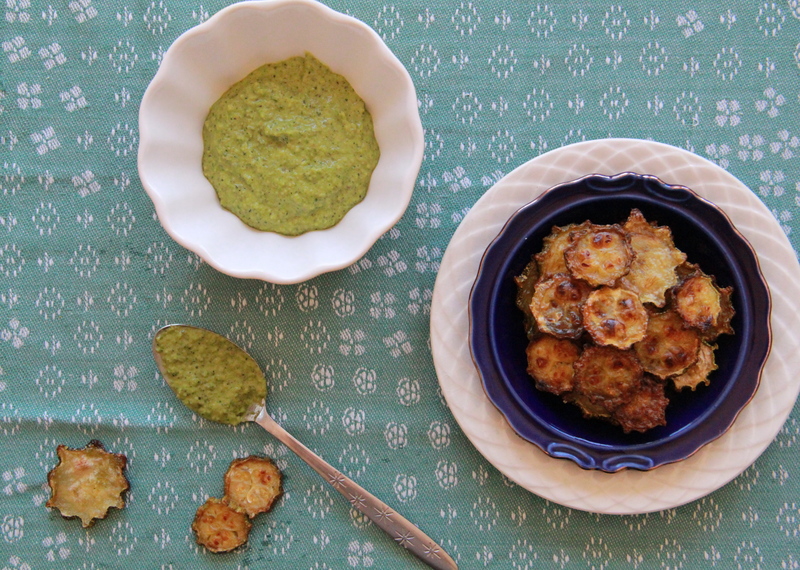 Zucchini chips and pesto and pasta, oh my! The perfect way to pay homage to summer’s end and usher in some crisp fall weather. 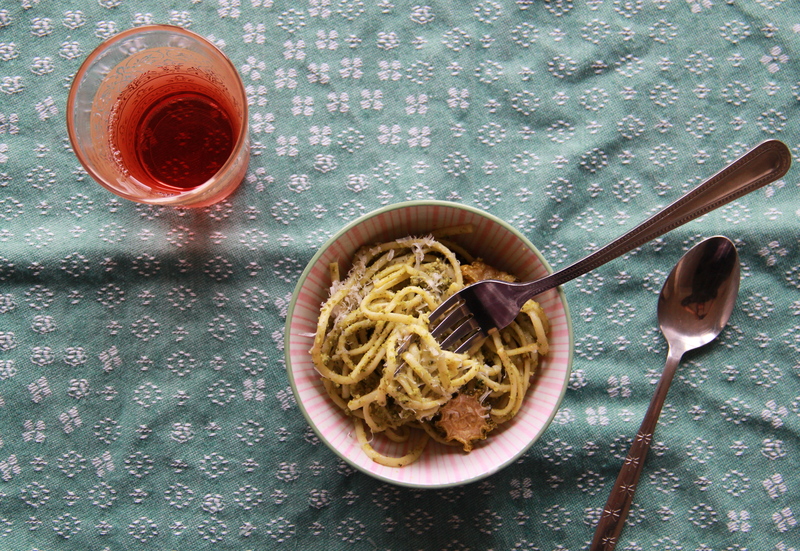 Please head over to The Bulletin at Terrain for the recipe! Mo’ fo’ Terrain!?!? You, my dear, are every bit as lucky as a wonderful, sweet little thing like you has the right to be. They’re obviously intelligent over there, as well as being the go-to place for way cool terrariums and stuff. Congrats, lovely. Now send me some figs. NYC misses you! haha thanks P-Mapes! Miss you! This looks so easy and delicious! Congrats on your wonderful introduction and feature at the Terrain blog! It’s great!!! This is fantastic, Molly! Congratulations! And woah, thank you for the incredibly recipe! trying to post again — this looks SO yummy – -and I’m thrilled for you and what you are doing!!! I will have a kitchen again before too long. this might be the first thing i make! love and miss you, chef molly! So fantastic!! Fabulous recipe, can’t wait to try!! and super congrats on your envoyness…so cool! Congrats about Terrain! It must be so awesome! And I must say, these look positively delicious! I must give them a try. Thank you my dear Sophie! G’morning Molly. Congratulations on your new association with Terrain! I don’t remember how I stumbled upon your blog, but I have been a regular reader for quite some time. As a professional chef myself, it is always nice to find others that are so passionate about food and see it for more than just “sumthin’ ta eat”. I am crazy about your writing style (especially your parenthetical asides/off blog conversations) and your posts always give me a laugh. Best of luck to and success in all you do! Chef Jeff, thank you so much! Reading this truly made my day. All the best to you, too! (1) We needed to be more careful about ensuring that the thickness was the same for each of our zucchini slices. Because a certain unnamed curly headed chef was careless in her slicing, some of the chip slices were thin and appeared to be ready for consumption well before other thicker slices. We then made the mistake of waiting until all chips were crispy before removing any chips from the sheet. This resulted in some burnt chips. (2) We couldn’t locate Romanesco zucchini in our local market. Instead, we used regular (?) zucchini and ran a fork along the length of the exterior to create a similar start-shaped look. We don’t know if this swap may have also contributed to the aforementioned burnt chips. Though, we doubt it. In any event, all chips were demolished during Sunday football viewing (burnt ones included). We plan to make a second effort at this recipe, and will let you know what results! Keep writing. We love your blog. This is awesome! Congrats!! Also, let’s be friends. Hi I’m Audrey nice to meet you!